I was thrilled to be awarded (along with sound team Lawrie Silvestrin and John Simpson) an Australian Academy of Cinema and Television Arts (AACTA) award for the best sound in a documentary for Whiteley. For those outside Australia, an AACTA award is our equivalent of a British BAFTA or American Oscar. Not only did the feature documentary Whiteley pick up the sound award; it also won best composer Ash Gibson Greig, best editor Lawrie Silvestrin and best director James Bogle. So, as you can imagine, it was a very happy table and we partied well into the night. The documentary, produced by Northern Pictures, is the story of Australia’s iconic artist Brett Whiteley, told ‘in his own words’ using personal letters, notebooks and photographs, interwoven with reconstructions, animations, archival interviews and rare footage. The documentary was quite a challenge, as there is no narrator to link the story together. We used actors to read press stories and letters and melded those voices into the actual archive footage. After working very hard to clean up the archival sound, I then had to take the pristine recorded voices of the actors and grunge them up so that they matched. Some also had to be playing out of old radios and TVs of the time. We had an actor reading Brett’s writings, and this voice, too, had to be matched to the archive. Because of the complexity of the edit, it ran well over schedule, and the film already had its cinema release dates, so it transpired that I had only three days to do the final mix on the 90-minute film. As I always want tweaks to the music in the mix stage, Ash moved his whole studio into my mix suite, which allowed us to add and change little bits as we went. The day before the awards, I took part in a ‘Meet the Nominees’ panel. It was a buzz to meet up with the other panellists: Stephen Smith (Wake in Fright), Robert MacKenzie (Lion), David White (Blue) and Cate Cahill (Killing Ground). Nigel Christensen did a great job as the moderator. You can see the panel here (my bit starts at 34 minutes). It is always said that filmmaking is a collaborative endeavour, so it is fantastic when the work of the whole team is recognised. Hounds of Love, now playing in cinemas across Australia, was written and directed by Ben Young and is his first feature film. After premiering at the Venice Film Festival, the film has propelled Ben’s career onto the world stage, and he is already directing big-budget American movie Extinction. The film has had great reviews all over the world, including 4 out of 5 stars from Australia’s leading film critic, David Stratton. This is not a film for everyone but, as one critic said, ‘brave audiences will be rewarded’. My role on the film was the sound design and mix. As the subject matter is very confronting, the film was a great sound challenge. Much of the action is implied rather than on the screen., and the film relies on the soundtrack to tell the story. For the house backgrounds, I used all natural sounds—cars, birds, etc.—so that the atmosphere feels ‘normal’. This changes as the camera moves into the room where the girl is held: I shut down all the natural sounds and used low room tones to make it feel tense and isolated. Planes play a role in the soundtrack. We wanted it to feel that the girl was not too far from home, where planes are heard all the time. I also used the sound of a jet, rather than music, as a tension device in a key scene towards the end of the film. As there are a lot of screams in the film, much work went into ensuring that they didn’t feel repetitive. The foley was done by John Simpson of FeetnFrames, who did a masterful job on the chains used to restrain the girl. The actors all walk around the house in bare feet, and so to make it more menacing, I asked John to re-create the footsteps by walking on creaky floorboards, especially in the hall approaching the bedroom. By the time I got to do the final mix with Ben, I had become desensitised to the shock elements of the film to the extent that I could concentrate on getting each scene as tense or as light as required. We had a lot of fun trying all sorts of elements to see what felt right. Having watched the responses of film audiences since it was released, I think we got it pretty right. Hotel Coolgardie has opened to great critical acclaim; see David Stratton’s review. More on Hotel Coolgardie in the next post. I have also just finished work on a film by Ben Elton called Three Summers—a fun romantic comedy, very different from the experience of working on Hounds of Love! Ash Gibson Greig composed the music for the documentary, weaving his music around the music of the time. The soundtrack was complicated, so Ash moved his music suite into my studio for the days of the final mix. This gave us the opportunity to tweak the music mix right up to the last moment. John Simpson of FeetnFrames did his usual great job on the foley, bringing to life the re-enactments and the painting scenes, which were all shot without sound. He managed to bring even the brush strokes to life, making you feel you were at the painter’s side. This is the outside of Luna Cinemas in Leederville, and I’m happy to say I was the sound designer and mixer on four of these films—Hounds of Love, Whiteley, Bad Girl and Hotel Coolgardie. What a buzz to have all four playing at the same time. Coming soon, news on Hotel Coolgardie and Hounds of Love. Some seven years ago, when I built my current studio, I wanted to find a controller to use with my Digital Audio Workstation (DAW), Pyramix. Pyramix is a great DAW for the work I do but, like all computer-based DAWs, it is controlled by mouse—and trying to mix onscreen with a mouse is just not user-friendly. I trialled different controllers but wasn’t happy with any of them. And then Frank Hinton, from ATT Audio Controls, sent me a SmartAV Tango controller on trial. I was keen to try the Tango, as I knew it had been designed by Joseph (Joe) Narai. I had used Joe’s DSP Post Station DAW many years before, and it was way ahead of its time. So I tested the Tango—and Frank never got it back! Since then, Tango has gone from strength to strength, its development driven largely by feedback from users. Within a week of installing it, I was on the phone with Joe, suggesting improvements, and he was implementing them. Tango has many clever features, especially when used in conjunction with Pyramix, and it has sped up my work flow considerably. Because of my enthusiasm for the product, I have worked with user groups, trained individual users and demonstrated the Tango at shows, including the IBC Exhibition in Amsterdam last year. After the Amsterdam show, Roger Savage, the owner of SmartAV, raised the idea of my making a video showing some of the ways I’ve used the Tango to improve my operations. I agreed—and ended up making three! So if you’re interested in checking out how I work with Tango, head over to the Videos page. 2014 was a year to remember for me, book-ended by two national sound awards. The year began with an Australian Academy of Cinema and Television Arts (AACTA) award for Best Sound in a Documentary for Desert War: Episode 1 ‘Tobruk’. Desert War was produced by Electric Pictures and was aired by ABC TV, BBC2 and BBC Scotland. Desert War is the account of the siege of Tobruk, told by the people who were there and portrayed through historical re-enactments. Mixing the re-enacted war scenes was one of the greatest challenges of the project. The sound team also included Glenn Martin, Ash Gibson Greig, Ash Charlton and Chris Bollard. 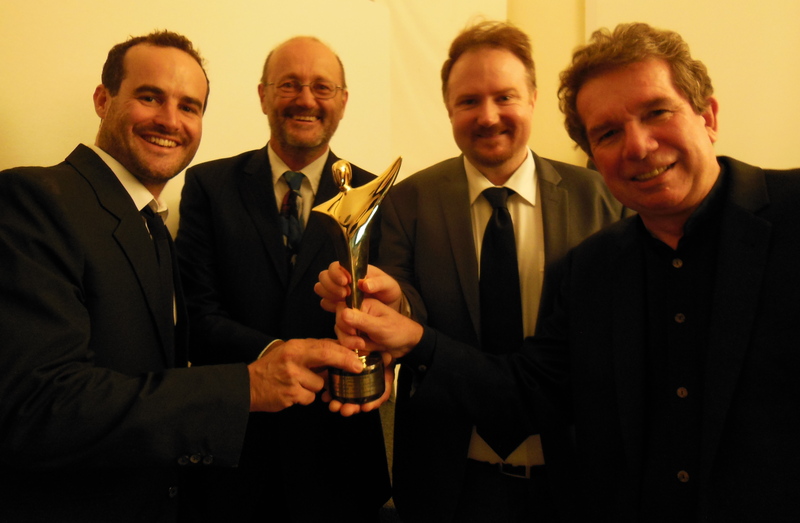 The year was capped off with the 2014 Australian Screen Sound Guild award for Best Sound in a Documentary for The Search for the Ocean’s Super Predator. Produced by Sea Dog TV International, this documentary was aired by ABC TV, National Geographic Channel Europe, NHK, TVNZ, Al Rayyan TV and Smithsonian Channel. In The Search for the Ocean’s Super Predator, a super predator’s underwater attack leads investigators to a mysterious natural phenomenon that attracts the ocean’s most fearsome predators. The dialogue was a particular challenge, as much the program was shot on a working boat, in windy conditions. All of the underwater sound was replaced, and the documentary was mixed in 5.1 surround. You can view the full program here. The sound team also included Glenn Martin, Ash Charlton and Steve Trowbridge. Both projects were dialogue edited and mixed using Pyramix, Tango, Horus and Frank Hinton’s Grover Notting Code 4 speakers. It was a privilege to work on these excellent projects, and congratulations must go to the production companies and to my colleagues.